I decided it was about time that I put together a collection of Bible verse to have with me when I'm at the hospital in labor. Even our birthing instructor said it was a good idea to have something like that on hand for encouragement. These verses encouraged me even as I looked them up and gave me so much more confidence in preparing for labor and delivery! I hope they encourage you in the same way. God's word is so powerful, especially in those hard moments of life. Isaiah 46:3-4 Listen to me...you whom I have upheld since you were conceived and have carried since your birth. Even to your old age and gray hair, I am He who will sustain you! 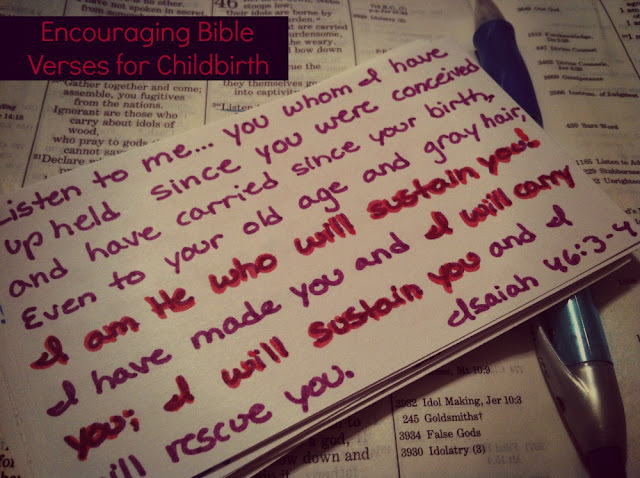 I have made you and I will carry you; I will sustain you and I will rescue you. Jeremiah 1:5, 8 Before I formed you in the womb, I knew you. Before you were born I set you apart. Do not be afraid...for I am with you...declares the Lord! Colossians 1:11 Being strengthened with all power according to his glorious might so that you may have great endurance and patience, and joyfully giving thanks to the father. Isaiah 40:29-31 He gives strength to the weary and increases the power of the weak. Even youths grow weary and tired, and young men stumble and fall. But those who hope in the Lord will renew their strength. They will soar on wings like Eagles; they will run and not grow weary. They will walk and not be faint. Philippians 4:13 I can do EVERYTHING through Him who gives me strength. I know there are so many more verses that would be applicable. If you have one I didn't list, I would love for you to comment so I can add it to my note cards! Thank you! Yes, I was so grateful to have these! 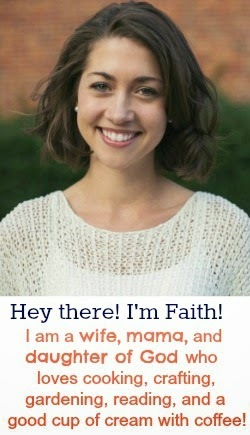 Thank you for the verses and encouragement! Those are wonderful. The I can do all things was really helpful for me in labor. As was a motivational line: "My body knows how to do this. My baby knows how to be born." Are you ready? Yes, that was so helpful for me to remember as well! God made our bodies to do this! Oh my goodness! I love this idea! I might just have to get started on making some note cards for myself. I love this! Here is a favorite of mine: Jer 29:11 (NIV) "For I know the plans I have for you," declares the Lord, "plans to prosper you and not to harm you, plans to give you hope and a future." I love this verse in Psalm 45:6..."God is in the midst if her, she shall not be moved; " I have never felt more at peace then when I was in labor. It was such a blessing. He was surely in my midst and I pray that for you as well. here are some verse that I had by me during my pregnancy.. I realize you meant these as comfort for pregnant women... so I wasn't even going to read this post... But I accidentally clicked on it while going through my reader and to say it was just what I needed would be an understatement...thank you so very much for posting these verses..
What a great idea! :) How wonderful that you thought of this prior to labor and delivery! Thank you for sharing and linking up at Simply Helping Him! :) Blessings! Thanks so much for posting this. I had a list of verses for my last pregnancy (june 2012) but when we moved I didn't take the cards with us. The verses you listed here and others that were added by commenters have saved me a lot of time finding the majority of verses again. Thanks! Oh I'm so glad! Praying you have a smooth delivery of your next and that these verses are an encouragement to you! Congratulations you guys, nice couple, have fun. These are lovely, I've added them to my labour bag for a weeks time, and some to the free printable I made and added to this weeks link up.